It’s 6am and there’s just a very faint hint of dawn. 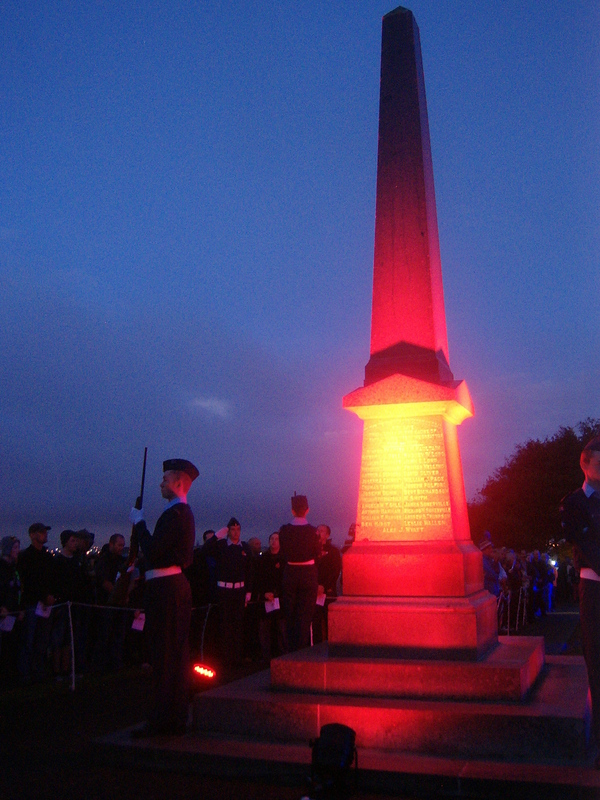 All around me in the darkness on Stockade Hill in Howick, east Auckland, a subdued crowd is forming for the Anzac Day dawn service. What little conversation there is consists of a murmured reminiscing about New Zealand soldiers who died during World Wars I and II. 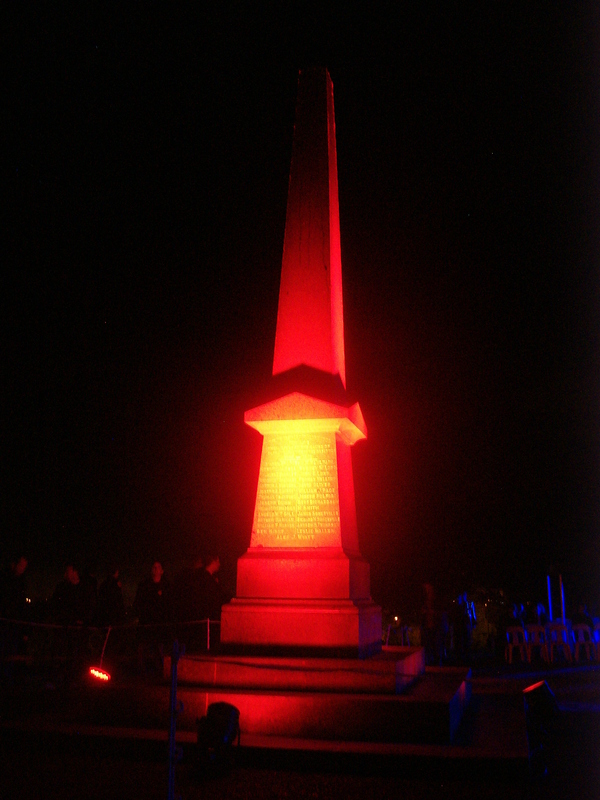 On 25th April 1915 the Australian and New Zealand Army Corps (ANZACs) landed at Gallipoli on the Gallipoli Peninsular in north-west Turkey. Casualties during fighting to gain control of the peninsular were high: it was the first time New Zealand and Australian forces had suffered such heavy losses – nearly 3,000 and 9,000 respectively. 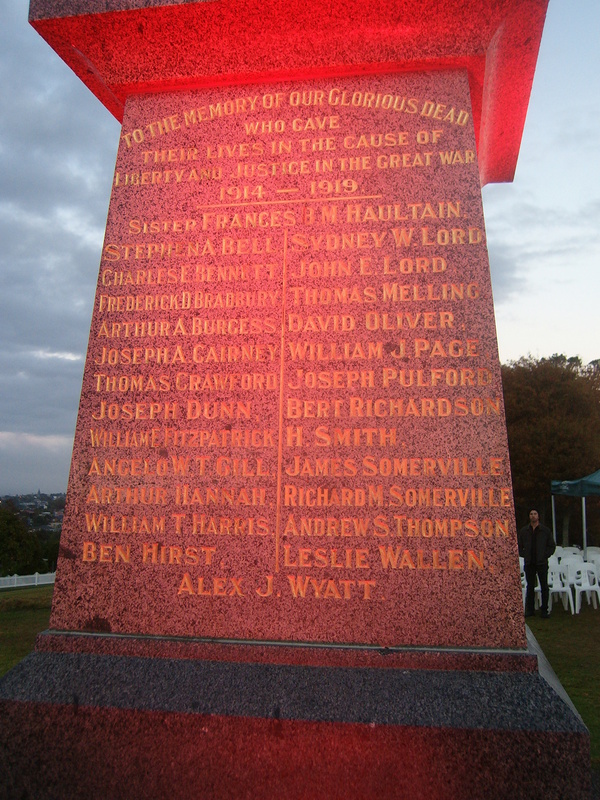 Since 1916, April 25th has been known as ANZAC Day. 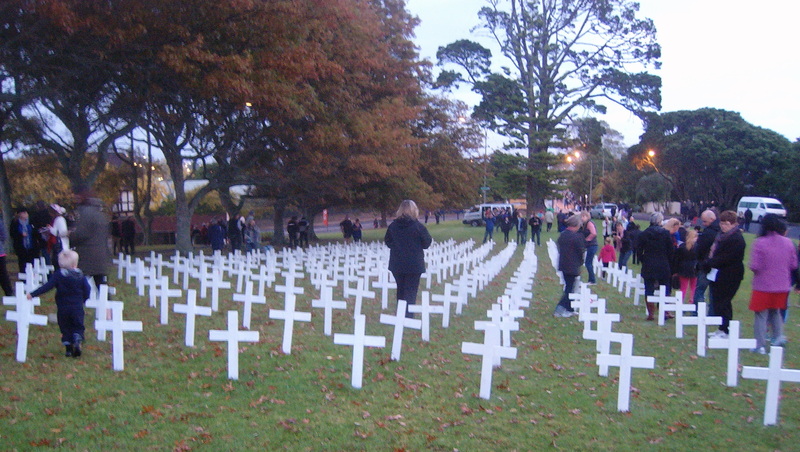 Throughout both countries dawn and daytime services are held at cenotaphs and war memorials and New Zealanders wear a red poppy. Those who have medals, wear them with pride. On Stockade Hill, a lone bagpiper plays a haunting lament at the start of the dawn ceremony. 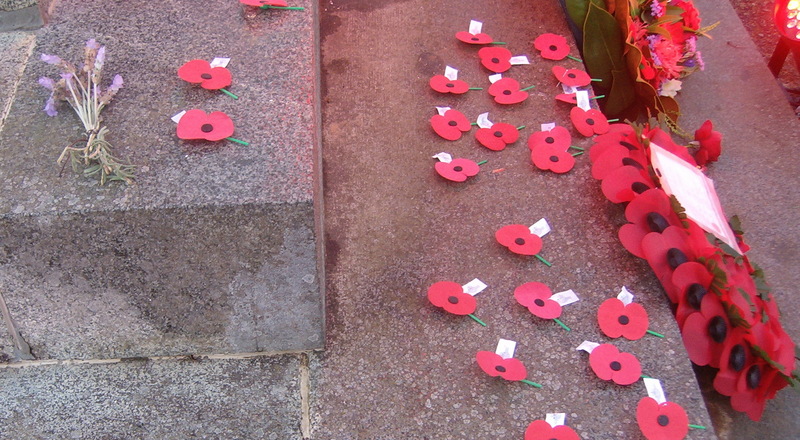 After the speeches, wreaths are laid at the foot of the cenotaph, and the Australian and New Zealand anthems are sung. 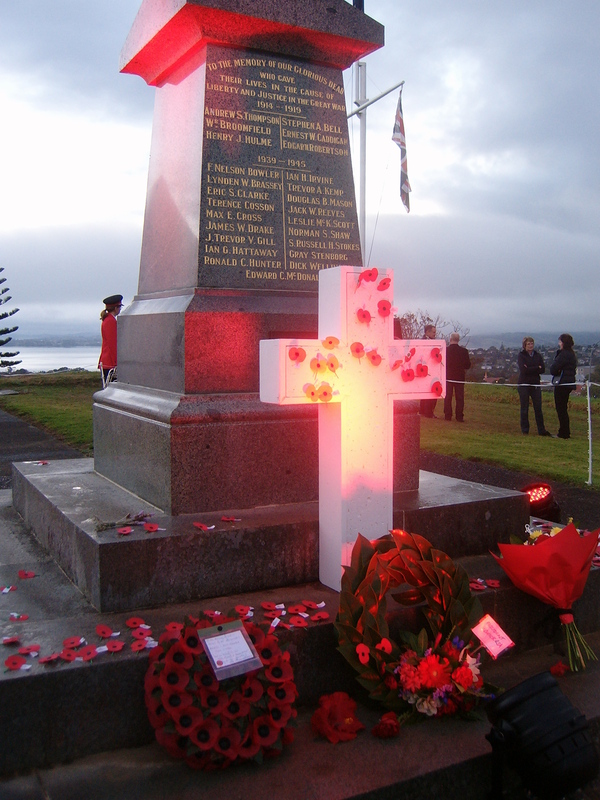 On the slopes of the hill white crosses represent Howick’s war dead: the names on some of the crosses are the same ones that are engraved on the cenotaph, and include a nursing sister. 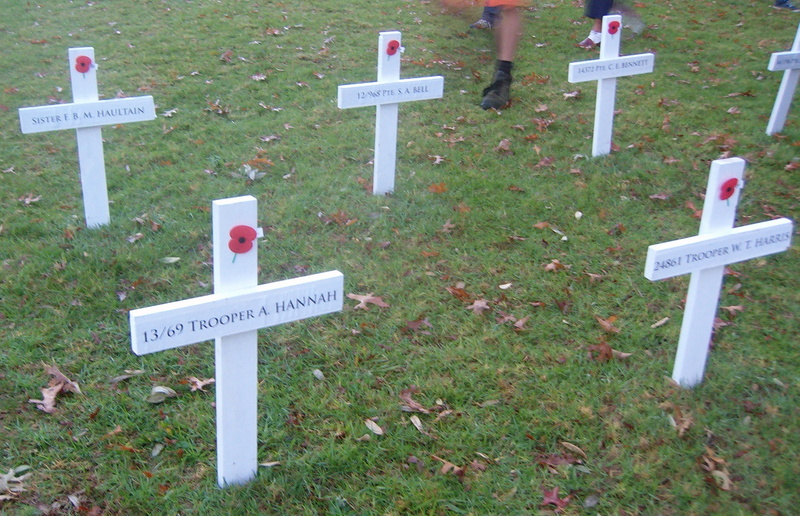 Other crosses are blank and we are invited to add the names of other people that we know of who died during the First and Second World Wars. I remember my uncle, Archie McKenzie, Dad’s brother, who died in Tuscany a few days before the liberation of Florence. During World War I, knowing how inadequate the soldiers’ food was, and needing to send a food parcel that wouldn’t spoil during the voyage to Europe, Australian and New Zealand women began sending their men Anzac biscuits – a nourishing, energy-packed variation of Scottish oat cakes. 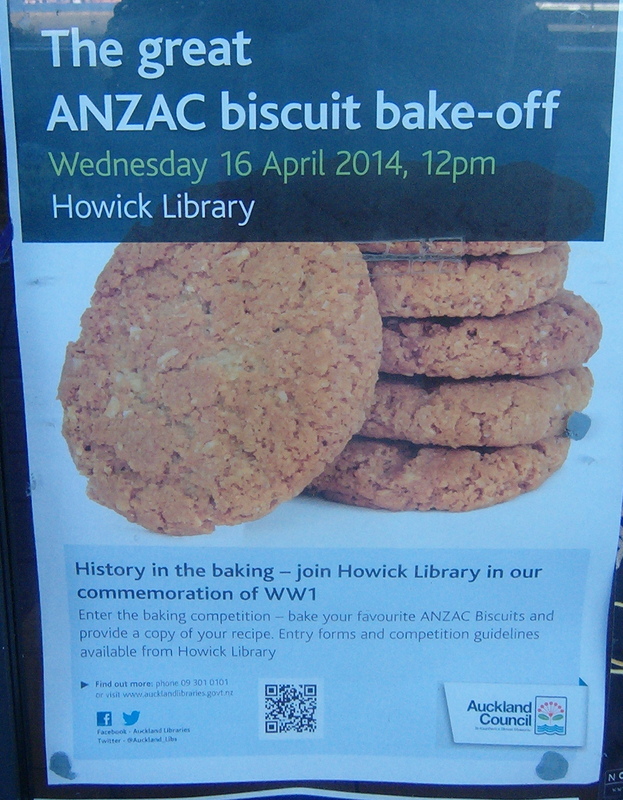 These biscuits are still popular today – last week Howick Library organized an Anzac biscuit competition. Here is the recipe from my grandmother’s “Aunt Daisy’s cookbook”. 125 grams butter, 1 TB golden syrup, 1 tsp baking soda, 2TB boiling water, 1 cup sugar, 1 cup coconut, 1 cut rolled oats, 1 cup walnuts, ¾ cup flour. Melt the butter and golden syrup. Dissolve the baking soda in the water and add. Add the other ingredients. A teaspoonful at a time, form into small balls and place on a greased baking tray, leaving plenty of space between each one. Bake in a slow oven for 30 minutes. Store in an airtight container. 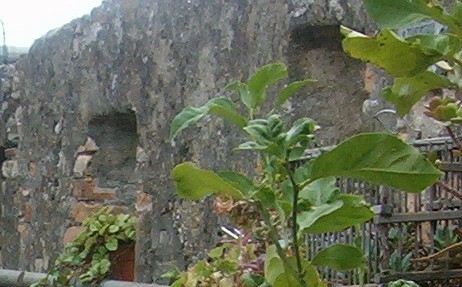 This entry was posted in Auckland, New Zealand and tagged ANZAC, Australia, biscuits, dawn, Gallipoli, Howick, poppy, soldiers, War, Zealand on April 26, 2014 by ventimigliaaltawords.